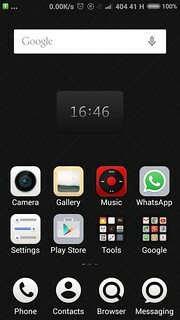 First, I want to show you the screenshot of my new phone: Xiaomi redmi 2. At 6K INR this is a wonderful phone — I love it! 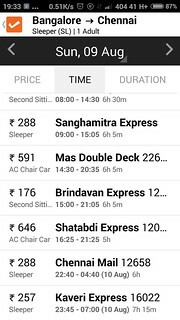 🙂 This post is about the Cleartrip Android app for bus, train, flight, and hotel bookings in India which I tested on my phone. I went to the Google Play store and downloaded the Cleartrip app for free. It’s lightweight, doesn’t take up much space on your device. On my phone, I have a 1 GB RAM and it worked pretty fast, without any lag. When I opened the app, I got an orange screen with a tick mark (Cleartrip logo) and then the welcome screen as shown above. 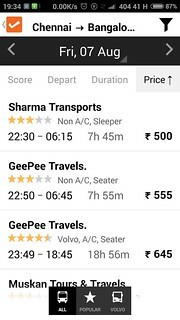 As you can see, there are various options like Flights, Hotels, Weekend getaways, Trains & Buses, and you can choose the appropriate option, based on your requirement. I tried all of them. One thing I loved about this app is: It’s a single window system for most travel booking necessities. It’s even integrated with our IRCTC Railway gateway and I checked the list of trains from Bangalore to Chennai on Sunday. If I click on a particular train, I can see the availability of tickets for that day and two days afterwards. As simple as that! I guess I will use this app to quickly check the train availability from now on. 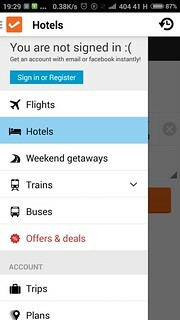 If I integrate my IRCTC account with this app (which I can), I can even book train tickets from within the app. I like that. Then I checked the hotel booking list for Bangalore. 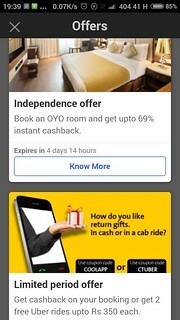 What a surprise — I got some amazing last-minute deals including the OYO rooms for below Rs. 400. And some of them are two/three star category! Guys, I tell you — if you are going to a trip and are about to book expensive hotels, don’t forget to check on the Cleartrip app for some amazing deals, especially if you are booking in the last minute! I am impressed. 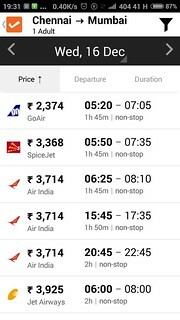 Then I checked the flight prices from Chennai to Mumbai during December. I have previously checked for deals in the same dates from some other websites, and the best I got was something around Rs. 4000. On Cleartrip, I am getting a flight for Rs. 2374! I think it’s a very good deal. Considering, the minimum journey time on train is 26 hours. I was thinking of booking on a train, but now I am tempted to change my mind. 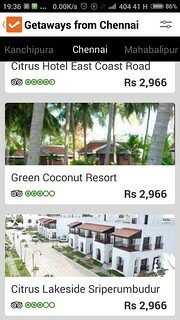 In the weekend getaways section, they have listed hotels/resorts around Chennai and nearby cities, but the pricing for all these properties (per day) is Rs. 2,966/-. Initially, I thought this section will offer guided tours, but it only features hotels, that too at a single price point. I don’t understand this concept. If I want to book hotels, I might as well book it from the Hotels category. What’s special about this? I think they should mention what’s special about this section, somewhere within the app. And then I found some interesting offers from within the app. I liked the above two. 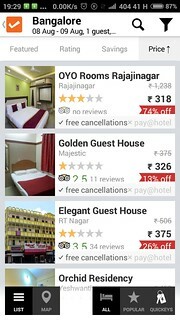 Discounted Oyo rooms and two free Uber taxi rides up to Rs. 350. I was just thinking why they did not integrate taxi services from within the app. Since we use taxis and autos frequently while on a tour, I wish Cleartrip integrates that too from within their app. Then, I’ll require only one app for everything travel-related. So guys, if you are planning to travel/take a trip in the near future, why not download and try the Cleartrip app from Google Play store? I found some great deals, esp. for hotels and flights — you might, as well.